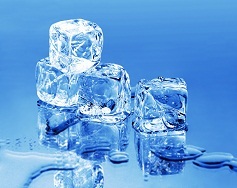 Use this experiment to demonstrate the effect of temperature on ice cubes. 1. Make three large ice cubes, each with different food colouring. 2. Take them out and put them in three different bowls. 3. Get the children to choose three different places around the room, or even outside, discussing with them where is warm and cold (e.g room temperature, radiator, fridge, near a light, by a window, in the sun, in the snow, sock drawer). 4. Wait 10-20 minutes then collect them in to one place at room temperature and see which has melted the most by looking at the amount of liquid in each bowl. 5. If you want it to be accurate you could even measure the melted liquid using a nurofen syringe or similar.